What do you traditionally think of when you hear silk pie? Could it be light and airy or satiny in texture? Yes, that would be what comes to mind for most of us, however, this silk pie is intensely decadent, rich, dark and chocolaty. 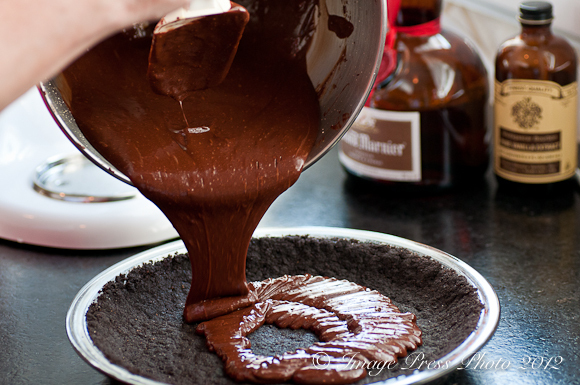 Its texture is very similar to this flourless Nutella Cake and is deceiving in its name. 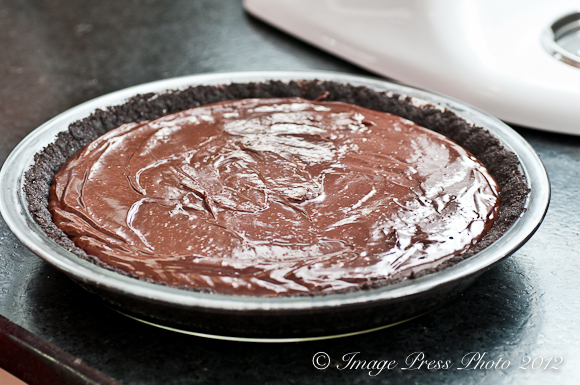 If you are craving a dark and dense chocolate dessert, this pie is what you should make. Chocolate pie is perfect with a boozy twist because chocolate and certain liqueurs make exceptional pairings. Grand Marnier is a classic combination added to chocolate with its subtle hint of orange, however, you can substitute your preferred liqueur in its place. Try Amaretto for a traditional pairing of almonds and chocolate or Framboise for another exquisite flavor combination of raspberries and dark chocolate . This recipe, from The Art and Soul of Baking (Cindy Mushet), satisfies any chocolate craving you could have. This pie has an intensity and richness that suggests a dessert by another name and is not a traditional silk pie. The combination of a crispy chocolate cookie crust, filling that resembles a dense, dark chocolate truffle topped with slightly sweetened whipped cream makes for an unforgettable dessert. I would suggest cutting the slices for serving while the pie is well refrigerated, but then let the slices warm a bit to room temperature. It brings out the intensity of the chocolate. 1. Preheat oven to 350 degrees and position an oven rack in the center. Put the cookie crumbs and the sugar in a medium bowl and stir well with a spatula to blend. Add the melted butter and stir until crumbs are evenly moistened. Transfer the buttered crumbs to a 9-inch pie dish or pan. Use the heel of your hand or the bottom of a drinking glass to press teh crumbs from the center outward into an even layer across the bottom of the pan. Use your thumbs to press the crumbs up the side of the pan and level them at the rim. 2. Bake 8 to 10 minutes, until lightly colored and fragrant. Transfer to a rack to cool completely. 1. Bring 2 inches of water to a low boil over medium-low heat in a medium saucepan. 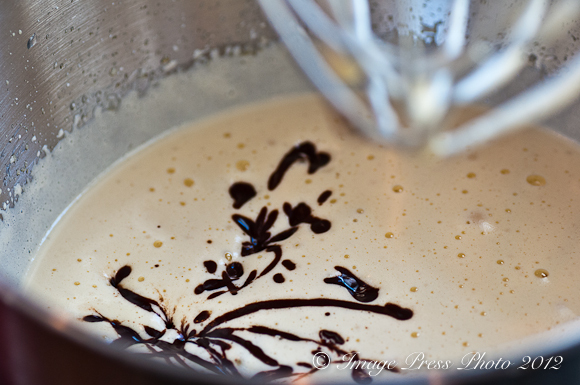 Place the eggs and sugar in the bowl of a stand mixer and whisk by hand to blend. Place the bowl over simmering water (the bottom of the bowl must not touch the water) and whisk constantly to prevent the eggs from scrambling. Heat mixture until mixture reaches 160 degrees F on an instant-read thermometer and the eggs look light in color and texture. (*To check the temperature, remove the bowl from the heat so the mixture doesn’t overcook while you are waiting for the temperature to register. If the mixture has not yet reached 160 degrees F, wash the thermometer so any possible bacteria will not contaminate the eggs during your next check - dry it, and put the bowl back over the water and continue to whisk. This step can take anywhere from 5 to 10 minutes. The more often you check the temperature, the longer it takes, so be patient.) When the eggs reach 160 degrees F, remove the bowl from the saucepan and beat on high for 3 minutes. Keep the burner on. 2. While the eggs are beating, place the butter, cream, and chocolate in a medium bowl and set the bowl in a saucepan over the simmering water. Let sit for 1 minute, then gently stir with a silicone or rubber spatula until the chocolate is melted and the mixture is smooth. Remove from the heat and wipe the bottom of the bowl dry. Add the chocolate mixture to the eggs, lower the speed to medium, and beat until there are no streaks of egg visible. 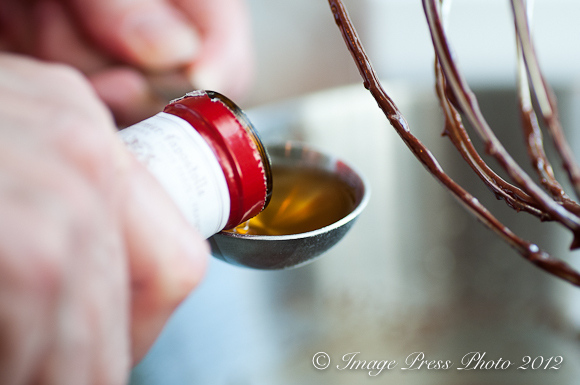 Scrape down the bowl and beat in the vanilla extract (or liqueur). Remove the bowl from the mixer and scrape down the side and bottom of the bowl., making sure that any streaks of egg and blended into the chocolate. Scrape the filling into the prepared pie crust and smooth the top. Refrigerate until cold, about 30 minutes. 1. In a clean mixer bowl, whip the cream and sugar into firm peaks. You may also use a hand mixer in a medium bowl. Use a silicone or rubber spatula to scrape the cream into the center of the pie, then use an offset spatula or back of a spoon to spread it all the way to the edge, making swirls as you go. For a more elegant version, pipe the cream over the filling, using a 1/2 inch star tip fitted into a pastry bag (but increase the cream to 1 3/4 cups and sugar to 2 tablespoons, as piping requires more cream). Sprinkle the top with chocolate curls or a dusting of extra cookie crumbs. Refrigerate for 30 minutes before serving. To serve, cut slices with a thin, sharp knife, wiping with a moist hot towel between slices. At this very moment, I want pie. That is all. Well, I guess it’s not…. I should add that i love the orange-chocolate pairing. It isn’t something that people do very often (have you done chocolate/lemon… LOVE!) but they work so well together. Oh my! This pie is absolutely fabulous looking. Great idea! What a lovely combination of flavors! I always loved orange chocolate, so this is a perfect dessert for me. Not sure why I never thought of it before! That bowl of chocolate filling looks good enough to eat all by itself! Especially with Scharffen Berger chocolate – it is one of my favorites lately. The Scharffen Berger bittersweet chocolate was excellent in this pie. It is the chocolate I will use most of the time since it is easily accessible and very good. How good does that look! I would love to try some. I reckon I would polish it off in 5 minutes flat! Spectacular! Sensational! I love this and want to make it! 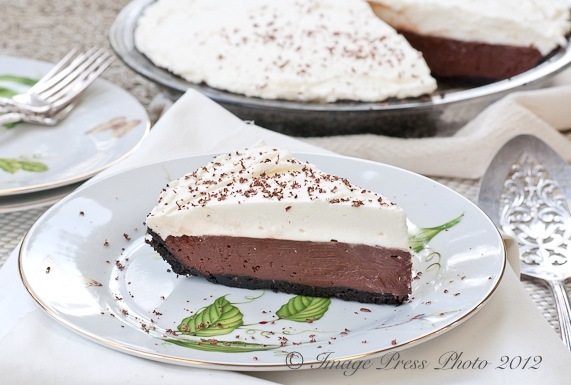 I have been thinking of making some sort of chocolate cream pie and this one is now at the top of the list! And love the addition of Grand Marnier… Beautiful, Gwen! My daughter loves orange and chocolate together, so I MUST make this pie for her, right?! Thanks for the recipe, I think she’ll be happy I found it. You? Not a baker? I beg to differ! Can I just say WOW, Gwen? That is one beautiful pie. I love the Grand Marnier with the chocolate..OH, I’ll just get down to the nitty gritty..I want your pie! Thank you. I enjoy baking, but don’t do it often since any of the things I make get consumed by just the two of us and end up on the hips. This pie was worth the calories, however, Pretty darn decadent. I love silk pies, but I mostly order them when I’m out at a restaurant. I should make my own. Pie season in my house is beginning. We love pies during the summer months. I hope you have a wonderful weekend, my friend. You deserve days of laughter, eating, and friendship! I bet this pie is an unforgettable dessert. 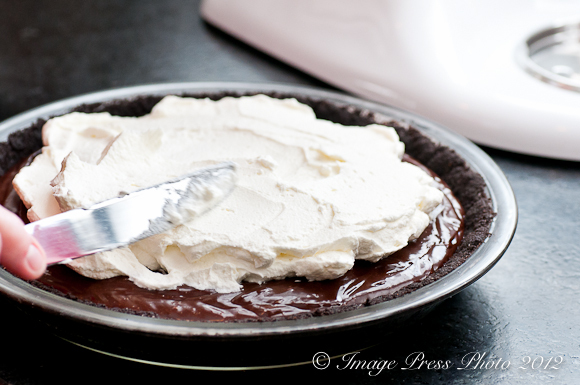 Your texture of both the chocolate and whipped cream look absolutely perfect. The 2 tablespoon of Grand Marnier would make the taste unbeatable. I love a good pie and I even think I would like your choice of a chocolate crumb crust. 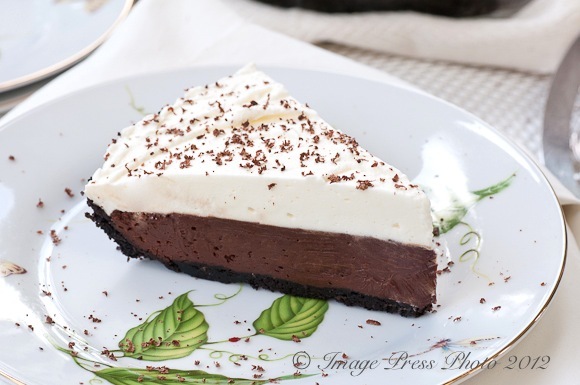 French silk pie…my absolute favorite ever. I’ve not tried it with orange liquer but have done Kahlua and Chambord…so I’m game to try! Now I want to make one today but I can’t…without company coming over I would eat the whole thing! Yes, this pie is addictive and we did eat the whole thing! I would love Kahlua or Chambord in this pie. Those would be wonderful flavors as well. Truly irresistible…I’ve made plain old French silk and Frangelico French silk…but now I’m thinking I need to try a citrus spiked version. How marvelous!